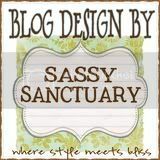 Crafty Sisters: For you...sister dear! My sister Nicole is super busy this season cutting and cutting away in her woodshop for her little business. She is too busy for extra crafting at the moment, but admired my last ornament wreath. 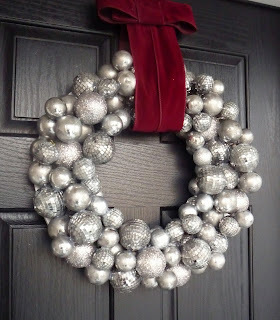 She mentioned that she would love a "mercury" silver ornament wreath. This is what I came up with....I think this might be more "tarnished' or distressed silver rather than the "mercury" that's so popular. Hope it's okay Nicky! I discovered "HONKS" the dollar store! It's a crafters haven! I picked up as many ornaments as I could, and I believe I finished off what was left of the silver. The ornaments get cleared out pretty fast in the dollar stores! I found some "disco" balls....that's what my kids call them! The other day I was reading the blog of fabulous Stephanie Lynn...Under the Table Dreaming, where she explained how to make faux Mercury Glass Trees. Go there for painting technique! I love everything she does! She used a combination of silver and black paint, then scratched off with a kitchen sponge. I then sponged on black paint, scratched away some paint with a kitchen scrub pad, and then sponged on some more black paint. I think they look like Pewter balls. I was going to try the clothes hanger ornament wreath, but it's HARD! I think the wire isn't long enough too! I had some leftover MDF rings in my garage from failed attempts with the sunburst mirror. They seemed to work perfectly for this wreath. You could use a simple wreath FORM from the craft stores. I added a burgandy, or maybe it's red velvet ribbon to hang. Nicky loves burgandy! 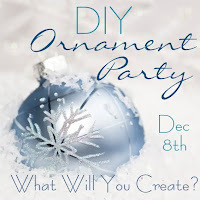 Centsational Girl's DIY Ornament party! 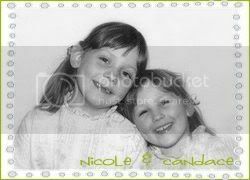 Nicole is going to love that-You are a very kind crafty sister! I would love to know what she thinks-hope she doesn't use that funny phrase! Wow, that is glitzy glamorous! Especially against that dark door. Very pretty! Thanks for linking up! LUV it!! So very elegant! This is so pretty! And... I so love silver this year! Way to go!! Wow - It looks gorgeous! I love the way they turned out! It looks amazing with the red bow on the dark door! Thanks so much for mentioning my link - I appreciate it! Happy Holidays! I love how your wreath turned out. 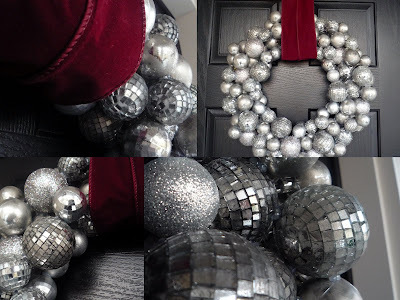 The combination of the silver ornaments with the "disco ball" really adds nice detail. Thanks for sharing the decorations. Love the time and extra effort you took to make them look more like mercury glass. I bet it took a long time but it is worth it for your sister. What a nice sister you are! I love it! If you can find them, maybe a silver beaded garland would fill that area for you, but I think it looks fine as is. This is such a nice take on the ornament wreaths. The aged silver is a great idea. i love this! it's so simple and pretty and sophisticated. i love the addition of the disco balls and the red velvet ribbon is the perfect hanger. It turned out great. 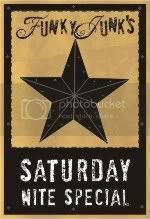 Looks great against your dark door. Great job! Nice pics too! 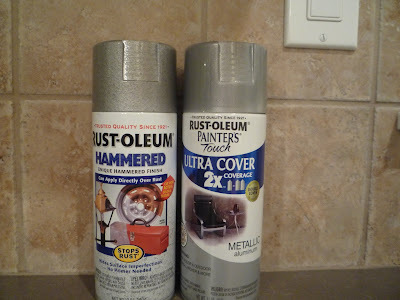 You know, I spray paint just about everything -- but DUH! why didn't it occur to me to spray paint ornaments?? Sheesh. Love it!! I picked up a similar wreath at Pier 1 last week. It was 50% off because some of the ornaments are scuffed. I figured I can fix them and hide the scuff marks -- your post has lots of great tips I can use :-) Thanks!! Love all the silver, so pretty! Love the silver! She will love it! This is beautiful! You are such a nice sister! Great project! I bet your sister loves it! Just read your comment- thanks for stopping by! Very unique and beautiful. Thanks for sharing. I think it looks great! I love the technique you used, my Dollar Tree is EMPTY of ornaments, so I'll be watching the after Christmas sales to find silver! What a sweet sister you are! 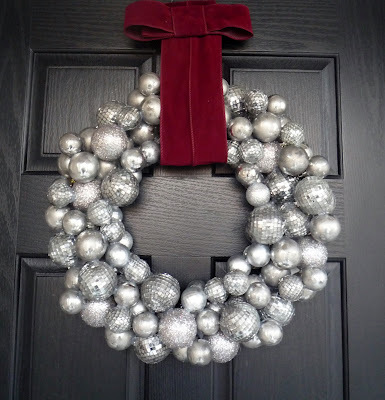 I love the wreath and how you achieved the finish. Thanks for sharing it! This is really fabulous! Nice job! It's beautiful! 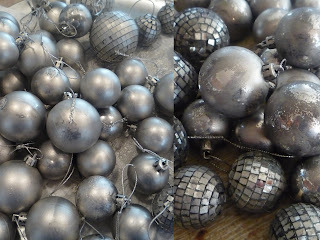 :) I'm working on some DIY mercury glass ornaments. A paint that did it all would be fabulous! lol Great job! I love the hammered finish spray paint. Oh my goodness, so so so gorgeous ! You MUST come on over and link up to my Ornament Party today ! Everyone must share in your creativity ! I love how your wreath turned out... it is beautiful! 220 balls later.....look what I made!